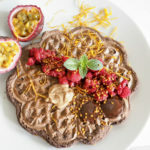 Almond cacao waffles - NOURISH TO PERFORM. Finally, I’m back to blogging. I’m so glad I finished all of my exams and even though, I have to work full-time for the next three months, I hope I’ll be able to provide you with some quality content. Having some time yesterday, I sat down to write down the recipe for my Instatstory famous almond waffles which I seriously have almost every night. Somehow, I’m addicted to them and can’t get enough of this chocolate and almond combination. 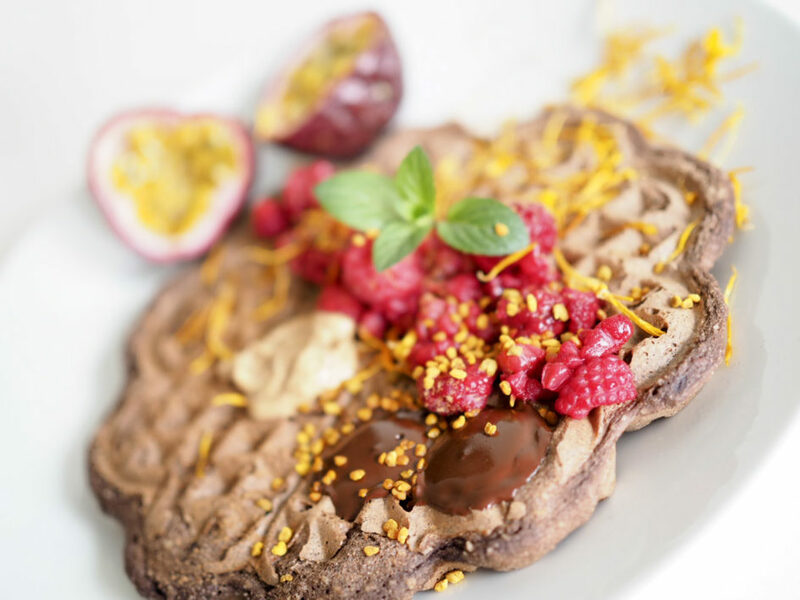 What I also like about this recipe is that you can easily adjust it to your macros. If you like them to be lower carb and higher fat, just use more ground almonds and less chuff. If you don’t want to have a lot of fat, use more almond flour and chufa instead of ground almonds. Unfortunately, I have not mastered the art of paleo and vegan waffles, yet. It is really difficult to find a dough that works without having to scratch it out of the waffle maker and eat cookie dough bites instead of waffles. But stay tuned for a sweet vegan recipe coming your way next week! As I already mentioned above, making waffles can be quite tricky. My waffle maker *doesn’t need extra greasing and I’ve done this waffles for three months now on a daily basis without any failure. I can recommend you investing in a good waffle maker instead of a cheap one… it is seriously no fun to get burned half liquid dough out of it… (talking from experience). Mix all ingredients and preheat your waffle maker./All Zutaten verrühren und das Waffeleisen vorheizen. If necessary, grease your waffle maker. Give about half the batter in the waffle maker and bake until the waffle is golden and the edges are crispy./Bei Bedarf das Waffeleisen einfetten (Meines hat eine Spezialbeschichtung.) Etwa die Hälfte des Teiges ins Waffeleisen geben und backen bis die Waffel goldbraun ist und die Ränder knusprig. Repeat the same with the leftover batter./Den Vorgang für die zweite Waffel wiederholen. Depending on your macro goals, you can use more ground almonds and less chufa (higher fat and lower carb) or the other way around (more carbs, lower fat). Anything marked with * is an affiliate link. This is one way to support me and make sure I can provide you with lots more content in future.